To maintain the navigability of water ways and harbor facilities dredging works of various extents are necessary. Troughout Germany mainly on the seaside amounts of dredged material accumulate. Mostly a relocation of the sediments in the waterbodies could occure. If relocation due to the characteristic is not possible the dredged material will be removed. The excavated dredged material is different from its mineralogical and chemical composition and characteristics. According to this e.g. the part of organic matter or grain size diverges widely. The dredged material of the North Sea is only contingently comparable with dredged material of the Baltic Sea and dredged material in Mecklenburg contingently comparable with the dredged material in the Pomeranian region of Poland. 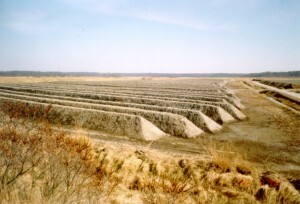 Despite this not all of the dredged material can return to use. Partly its heavy contaminated so that it can only be landfilled. 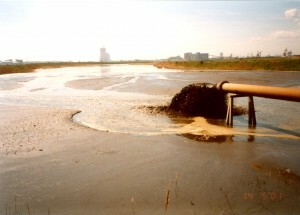 But due to the silt and organic matter most of the dredged materials offer a good and stable crumb structure and high sorption capacity for water and nutrients. The wide range of the barely polluted or unpolluted material can contribute conservation of natural resources. Specially the dredged material conditioned in the IAA Rostock (treatment facility) comprehend 100.000 m³/a. It is uncontaminated and ready for reuse. So far the application occurred in landscaping, soil improvement or reclamation of disposals.